Daniel contacted us to arrange a new therapy reception desk for Central Coast Therapy, his wife’s company. They were after a reception desk to portray a professional business as soon as someone walks into their office. They also needed loads of working space behind the desk. The Longton Reception desk was the desk they were after. 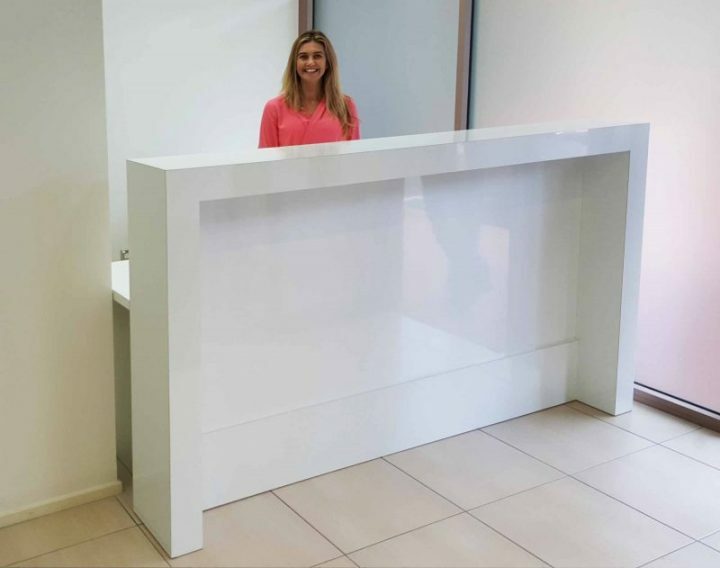 This white gloss reception desk has a simple elegant design that faces the customer area. Combined with this is a large return on the desk for a lot of useable space. This desk is made of 16mm HMR board covered in hard wearing gloss white laminate. Under normal use this desk will last a long time. Central Coast Occupational Therapy is a local company offering services to those surrounding Erina. They help with things like aged care, home modifications, workplace assessment, paediatric intervention and much more.